Welcome to Fallout History 101, a brief overview of some points in history quite relevant to the Fallout universe when it comes to major settings and story points. The Fallout universe is not unlike our own, up until a certain point. A world of science and wonder but with it’s culture deeply set in the 1950’s style and manners. The exact point in the timeline, where Fallout splits from our own has not been specified. The divergence is known to have taken place between 1945 and 1961. Our first location relevant to the Fallout universe is built in 1942, the Sierra Army Depot or SAD. The depot, first seen in Fallout 2, was located north of New Reno. The depot was originally used to store unused munitions, then used to decommission weapons. As of 2050, the SAD was once again re-purposed as a weapons and robotics research facility. It was during this time that Skynet was created to watch over the research. Just before the Great War occurred, the SAD had it’s defenses armed and was evacuated and sealed due to personnel redeployment. It was then not heard of again until the events of Fallout 2. The next major setting to be founded in the Fallout universe is the West Tek Research Facility, which is later known as the Glow. Originally appearing in Fallout, the facility was created in 2002 by West Tek, a major defense contractor for the US Department of Defense. The facility is best known for creating one of the major plot devices in the games, the Forced Evolutionary Virus or FEV for short. The Forced Evolutionary Virus, was originally known as the Pan-Immunity Virion Project. It’s purpose was to create an immunity to the New Plague. The New Plague as it was known was a virus called Limit-115 that first appeared after Chinese agents broke into the Hoover Dam testing facility. The virus was being developed as a possible biological weapon to be used against the Chinese, as they were the primary threat to American interests. A vial of the virus broke open during the break-in and cause an epidemic in the southwest United States. Quarantines were put in place and West Tek was given the contract to develop a cure. FEV became a major plot point in Fallout 1, 2, and 3. 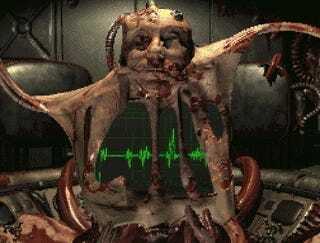 In Fallout 1, the Master, also known as Richard Gray, became exposed to the virus and became mutated. He then began experiments on other wastelanders and created the Super Mutants. Harold is also an FEV mutant, yet his mutation was very different, mostly due to his minimal exposure to the pure stain of the FEV. In Fallout 2, Frank Horrigan, an Enclave soldier with psychotic tendencies, became exposed to FEV and became a hulking soldier that would go onto to become the game’s final boss. In Fallout 3, FEV was used in experiements with the dwellers of Vault 87. This would be the origin of the Super Mutants in the Capital Wasteland. They also created one of the most iconic items in the game, the T-45d Power Armor. 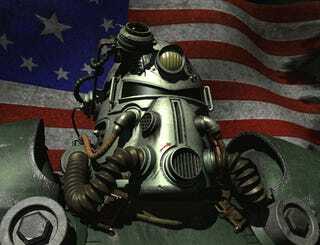 The power armor would see major deployment in the Anchorage campaign. The FEV research was eventually moved to the Mariposa Military Base. The facility was hit directly by a warhead during when the bombs dropped, releasing the FEV from the experimental vats, into the atmosphere. The facility also became highly irradiated, giving it the nickname, The Glow by wastelanders. Speaking of the Mariposa Military Base, the base was founded in 2076. The base, once completed, was used as the primary research facility for the FEV. The experients being conducted there were eventually discovered to be using military prisoners. This led to a mutiny by the military personnel. They killed all the scientists and abandoned the US. Military. These soldiers would later became The Brotherhood of Steel. After bombs fell, they would then travel to the bunker in Lost Hills which would become their head quarters for centuries. In the year 2042, Robert House would go on to found RobCo Industries which became a major robotics manufacturer and defense contractor. Mr. House, born in 2020, was robbed of his inheritance from his father by his half-brother Anthony House. This was later rectified when Mr. House bought out the tool company, H&H Tool Company, as well as REPCONN Aerospace and The Lucky 38 Casino. By the year 2065, Mr. House would come to the conclusion that nuclear war was inevitable, and set up a plan to protect Las Vegas and put himself into cryogenic slumber. He would later awaken in 2137 and reveal himself in 2274. In the year 2044, the most amazing drink to grace the lips of the human race was invented. That’s right, Nuka-Cola was created by John-Caleb Bradberton. Using a mixture of 17 different fruits, Nuka-Cola had such a distinctive flavor that it created a very dedicated following and became the most popular beverage in all of America. After only 23 years, there would be Nuka-Cola Machines on every street of America. Nuka-Cola Quantum was later developed as a specialty flavor of the popular soft drink in 2077. It included an 18th fruit in it’s mixture and a radioactive isotope to give it a distinctive blue glow. After the Great War, the bottle caps of the popular soft drink, would later become the currency of choice in the wasteland. As resources dwindled, the US would eventually annex Mexico and gain control of their oil reserves in 2051. Around the same time, the European Commonwealth would begin to go to war with the Middle East over their oil reserves. With such a high priority over resource control, the arguments between countries would lead to disbandment of the United Nations by 2052. The Vault-Tec demonstration vault. It was not part of the experiment, and was the Master's vault under the Cathedral in Fallout. A special vault designed to "monitor and control" other vaults, maintain the geniuses of the pre-War United States in cryogenic stasis and improve the future Wasteland conditions with a robot army. A control vault designed to open after 20 years, but kept closed longer due to the wishes of the vault inhabitants. However, an unplanned water leak forced the occupants to open in hopes of trading with the outside. Unfortunately, all of the vault's residents were massacred by a group of raiders known as the Fiends shortly after they opened the vault door. A control vault, intended to open and recolonize the surface after 10 years and is equipped with a GECK. Vault City is the result. This vault was a social experiment testing human nature - most specifically the ability to sacrifice oneself for others, and the ability to place ideals above one's own life. In order to study the effects of radiation on the selected population, the vault door was designed not to close properly. This is the Necropolis vault and a large population of ghouls was the result. Intended to stay closed for 200 years as a study of prolonged isolation, the broken water chip forced Overseer Jacoren to improvise and use the Vault Dweller as a pawn. Later study of the Vault 13 records by the Enclave led them to their current plan to end the war. Intended to stay closed for 50 years and include people of radically diverse ideologies. Gathered from what Aradesh says in Fallout, he has quite a bit of multicultural flavoring to his speech. The birthplace of three raider groups and Shady Sands (later to become the NCR). The vault was raided in 2154 and its inhabitants taken prisoner by the Master's Army. They were subsequently turned into super mutants. It is unknown what this vault's experiment was, or if it was one of the seventeen control vaults. The vault was segregated into two groups, Red and Blue. The groups lived in separate sections of the vault and the inhabitants may have been chosen due to pre-existing paranoia. This vault's purpose was gambling, reinforced by having only compulsive gamblers admitted as vault residents, and with all conflicts within the vault to be resolved through gambling. It is one of the few non-control vaults that didn't end in failure. Apparently a vault designed to develop advanced agricultural technologies. Successful experiments were executed, creating strains of plants that could grow under artificial light. However, an experiment on pest control involving a genetically-manufactured spore annihilated or transformed the vault's inhabitants. This vault would be overcrowded deliberately. 2000 people would be assigned to enter, double the total sustainable amount. No one in this vault was over the age of 15 when they entered. Parents were intentionally redirected to other vaults. Harold is believed to have come from this vault. The armory was overstocked with weapons and ammunition and not provided with a lock. The Boomers, the weapon-crazy inhabitants of Nellis Air Force Base, descend from the inhabitants of this vault. The food extruders were designed to produce only a thin, watery gruel. No light bulbs of more than 40 watts were provided. Populated by twenty men, ten women, and one panther. Most of the equipment was designed to break down every few months. While repairable, the breakdowns were intended to stress the inhabitants unduly. All entertainment tapes were removed. All entertainment tapes were removed except those of one particularly bad comic actor. Sociologists predicted failure before Vault 55. Of the one thousand people who entered, there was only one woman. Of the one thousand people who entered, there was only one man. All jumpsuit extruders fail after 6 months. Most of the inhabitants were Mormons. The city of New Canaan was founded by the vault dwellers after they left the vault. This vault was designed as a control group for the vault experiment. Like Vault 3 and Vault 8, it was intended to open and re-colonize the surface after 20 years. Populated by one man and a crate full of puppets. In Fallout 3 a Vault 77 jumpsuit is acquirable at Paradise Falls along with a holodisk detailing its disturbing nature. Populated largely by renowned musicians, this vault was a test bed for a white noise-based system for implanting combat-oriented posthypnotic suggestions. Evaluation of performance of an omnipotent, dictatorial overseer in a closed community. This vault was intended to never open. Psychoactive drugs were released into the air filtration system 10 days after the door was sealed. The vault houses a cloning lab and all (surviving) residents are clones of one man called Gary. After being closed for 200 years, Vault 111 opens and the sole survivor of a massive disaster within the vault emerges. The survivor is the protagonist of Fallout 4. Home of the Tranquility Lane virtual reality simulator. A fenced construction area in a small cave north of Vaults 13 and 15. It may have been the first location of Vault 13 before its relocation. By the year 2060, oil has become all but non-existent. The US starts looking into fusion technology as a suitable replacement to oil. Around the same time, European Commonwealth, with the war with the Middle East no longer needed, disbands into several states fighting over the resources that remain. By 2066, fusion cells have been created as a replacement for oil and several regions are powered by fusion reactors. After failing energy talks with China, the Chinese invade Alaska in the winter of 2066, beginning the Sino-American War. This would last until the Great War occurs. As part of the war effort against the Chinese, the US would annex Canada between 2072 and 2076, Canadian rioters would be shot on sight. The use of biological weapons by the Chinese would push the Pan-Immunity Virion Project into full motion in the year 2073. By 2074, the US cuts all ties with other countries stating that its energy resources would be limited to American use only. By June, of 2076, the the T-51B Power Armor was in full production and was used to invade mainland China, leading to an American victory. The Great War would occur on Oct. 23, 2077. Nuclear Warheads were launched and all other countries retaliated with their own. America as we know it is no more, all that remains is irradiated rubble. Mr. House’s defenses for Las Vegas lessens the damage to the Mojave Wasteland. Mariposa is untouched by the bombs and those within are protected. As the years go by many species die and many species, including some humans begin to mutate due to the radiation. By 2083, Necropolis is founded by the ghoul survivors of Vault 12 in Bakersfield. It is around this time that The Enclave begins to take shape with the survivors of the US Government, including the President, on an oil rig located off the California coast. By 2150, many settlements have been founded, including Shady Sands, The Boneyard, The Hub, and Vault City. Vault City was unique as they were able to use a G.E.C.K. The G.E.C.K., known as the Garden of Eden Creation Kit, was developed by Vault-Tec to help create a suitable environment for the vault survivors. It was during this time that Harold, and Richard Grey would conduct their journey to the Mariposa Military Base. Harold would return mutated and shunned by his former business partners at The Hub. While Richard Grey would become the Master and begin his creation of The Unity. The Unity, is the Master’s vision of how the world should be. He plans to use the FEV vats at Mariposa to this end and create his Super Mutant army. Then finally in 2161, the Vault Dweller would be sent on his quest for the water chip, officially starting the first Fallout game. This information comes from the Fallout Wiki, known as Nukapedia. It is a great source for all information Fallout related and is the fastest source for all information regarding Fallout 4 once it is released. Come back tomorrow as I go over my favorite missions from the Fallout universe. Don’t forget my previous articles with all things Fallout related. Let&apos;s Talk About The Upcoming Apocalypse!